As part of the Upcycled Collection this design is composed almost entirely of re-purposed materials, mostly vintage. The purpose of this collection is to reduce waste, and give new life to materials which would otherwise be discarded. Purchasing a fabulous necklace from this collection ensures that you will own a one-of-a-kind design that is also environmentally friendly! 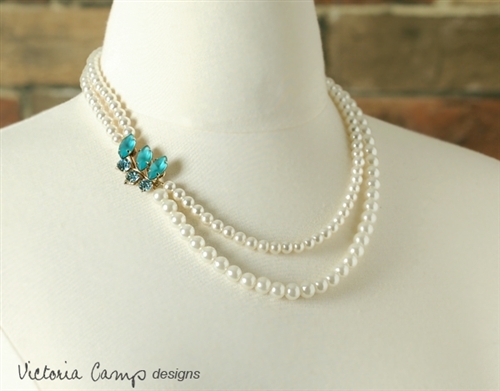 This pretty necklace is designed with a double strand of vintage faux (plastic and glass) white pearls, and a re-purposed blue rhinestone accent piece on one side. The vintage rhinestone focal (upcycled from a vintage earring) has three pale blue sparkly faceted circle rhinestones, and three translucent aqua blue smooth navette rhinestones. 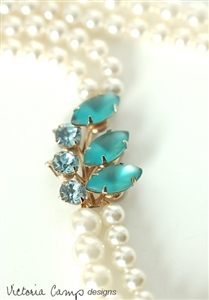 All of the rhinestones are prong set in a gold toned setting. 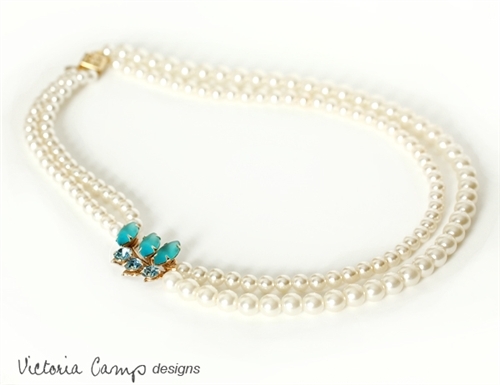 The total length of this necklace measures 20"/50.7cm based on the longest/lower strand, and finishes with a gold toned box clasp closure.